LivingLite line of trailers includes 5 models of Quicksilver family; the smallest one Quicksilver6.0 can be towed not only by small cars but also by larger motorcycles! Weighing in at around 1,500 pounds (smallest units) the Livinlite travel trailers for small cars are the most durably constructed lightweight campers currently on the market. They’re ideal for families searching for a camper that’s not only portable but also fuel-efficient and environmentally friendly. Unlike traditional RVs that are composed of wood and steel, the Livinlite travel trailers are constructed of 98 per cent recyclable material. The floor and ceiling panels, exterior surface skin, and interior cabinets are all fashioned from aluminium, as are the frame, sidewalls, and floor decking, while the countertop and table-top surfaces are made of composite material. Even the chassis of the trailer is made of structured aluminium—making it less vulnerable to the wear-and-tear due to off-road living. As the company advertises it- “No rot, no corrosion” and obviously we can add – no headaches! There are thirteen different models of Livinlite travel trailer. All of them include: water-resistant countertops, 76-inch interior headroom, easily removable mattresses, stabilizer jacks, and a spare tire. They can sleep at least three people and have fresh-water capacity of 38 gallons. Several models include a tip-out bunk in place of the standard bunk beds, which gives the buyer added floor space without actually increasing the length of the vehicle. 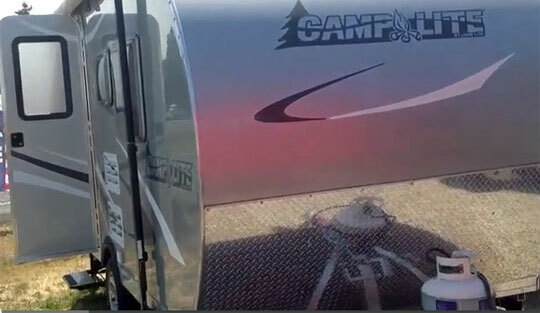 Unlike most other towables in the market, you have the option of choosing your camper in a variety of different colors to match the color of the towing car. The trailers are insulated by the laminated solid foam-core insulation in the walls and ceiling that protect the interior from the bitter extremes of heat and cold. Dry weight is 2,650 pounds while cargo weight clocks in at about 5,000 pounds. All units come with a three-year structural warranty. The LivinLite travel trailers can be towed by full-sized sedans and most minivans. Beginning in 2013 the recreational vehicle company also offered a fifth-wheel segment, the “Mercury.” A fifth-wheel differs from a traditional RV in being a two-level unit that places the master bedroom over the truck bed. Because of this distinct layout, fifth wheels generally have more storage space and sit higher off the ground than a travel trailer. 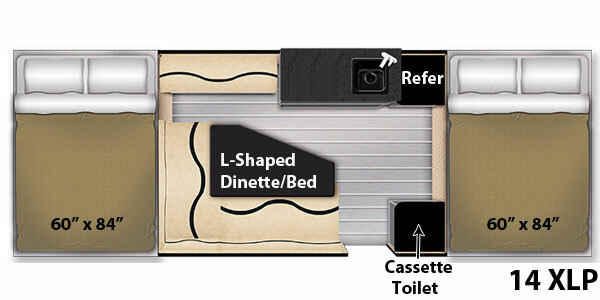 The LivinLite Mercury RV features two 24-foot floor plans, and dry weights of less than four and a half tons. LivingLite line of trailers includes 5 models of Quicksilver family, correspondingly Quicksilver6.0, Quicksilver8.0, Quicksilver10.0 as well as Quicksilver-XLP and 18SUT. The first model is the smallest one and can be towed not only by small cars but also by larger motorcycles! The XLP model expands the features offered by Quicksilver basic line of trailers. It comes with 30-inch high sidewalls, queen beds on either end of the trailer, a dinette, refrigerator, grill, and furnace. And, like the other LivinLite models, it includes cabinets, lights, shower, rear deck and a storage box—all the comforts of home in a vehicle roughly the size of a small car. At only $10,999, the Quicksilver is also decently affordable. The model 18SUT is another example of ingenuity. Contrary to the designs of majority of expandable trailers it expands sideways!